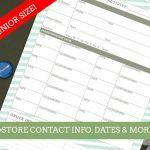 As you probably already know, back in October I launched a line of Printable Modular Planners in my store. Well, I’m happy to say they’ve been a huge success!! 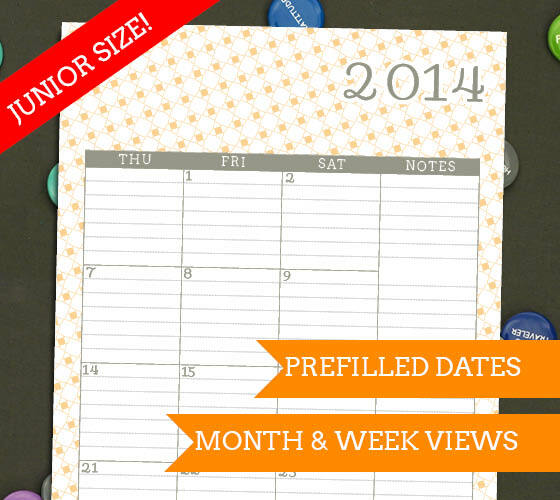 So huge, that I’ve been getting tons of requests for a printable half size planner. Now, I don’t use a small size, so I never thought about making one, but with so many people telling me how much they love the full version and wish it was smaller – I just had to! Oh, and did I mention I added 2 new colors to!? I created Ashley Orange for my dear friend Ashley, and Mint Stripes because I got so many requests for a green version. COLORS: There are now 5 designs. I designed all of these patterns myself! FEATURES: This year I took all of the feedback I got from the 2013 and the student planners and made sure to tweak things for this new planner. It boasts a lot of great features!! Yearly view page, with 2014 and 2015 laid out in front of you. “Sneak peak” of upcoming month in the month view. Notes page at the end of every month, so you have a stopping point to put your Add Ons! PDF format, set up to print front-to-back. I specifically made the Geometric Grey to save on ink! This year, I decided to make the planner modular. This way, everyone would start with one of the “basic” planners, and then make it their own. I know some of you are wondering – “Where is the blog tracking! ?” Well, its here! But its not alone. Check out all the add ons I’ve created so far! 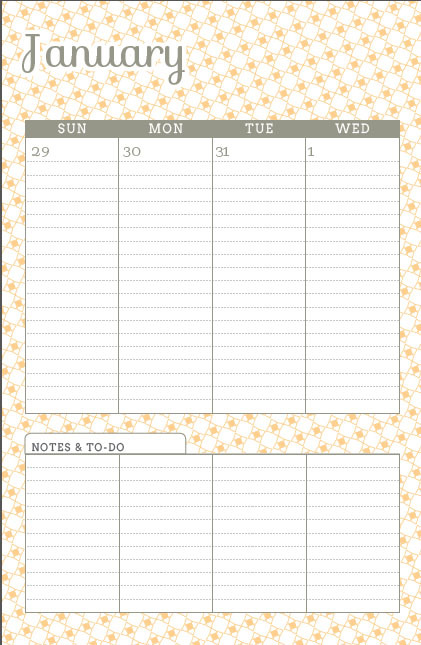 Print as many as you want and turn your planner into a notebook! Fill in the blanks with your targeted Social Media or statistics. Track your weekly, or monthly progress. You choose! Print one for each child, each sport – whatever! 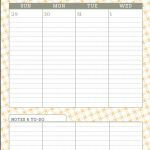 Use these pages to keep track of coaches/contacts, season start and finish, special days, games etc. 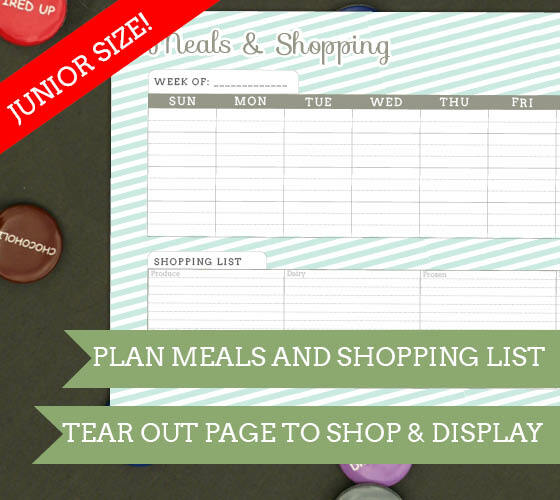 The meal planning planner not for you? No problem! Print these pages and tear them out to take shopping, and hang on the fridge after! 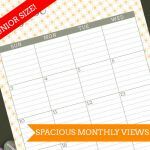 Track baby’s first steps, your fitness goals, or just birthdays and anniversaries. 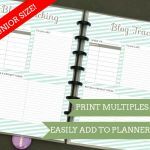 One of the biggest hurdles to the Junior sized planners was printing. 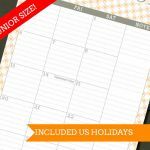 I created these planners to easily print from home on letter sized paper. Switching to half size meant (I thought) printing two pages on a sheet, and then cutting them. That sounds easy, but how would you print front to back that way? How could I ensure it was easy enough for the average person to figure out? Cut your paper to 8.5 x 5.5 sheets. Staples or OfficeDepot will do this for a nominal fee. ($4 or so per 100 sheets). I did mine on my rotary cutter. 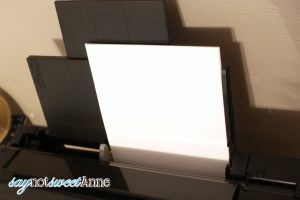 Load your paper into your printer’s tray, being sure to use the side you would normally use for envelopes. 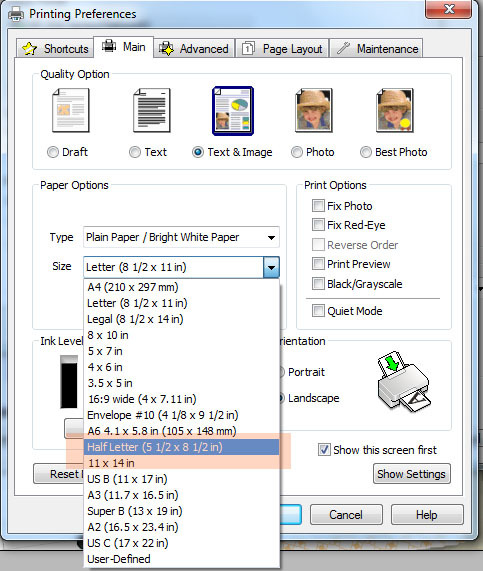 If your printer has paper guides, be sure to set them to 8.5 x 5.5. 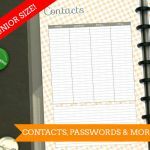 Open the planner file and click print. This should bring up some settings. Every printer is different, so it is difficult for me to tell you exactly what to click. But usually there is a “page setup” or “advanced” or “Printer options” tab. In that tab, you’ll usually find the paper size. Change it to 8.5 x 5.5. Here is what mine looks like. I had to click Setup > Preferences > Print Preferences to get here. 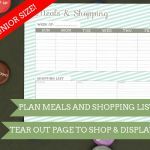 Navigate your menus to find the double sided print option. Make sure that is on too. 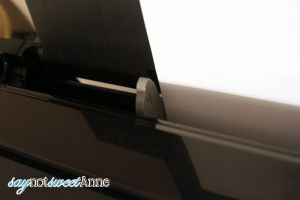 For most ink jet printers, they will print the back side of all the pages first, then have you put the paper back in (per your printer’s instructions) to print the other side. That’s it! If you aren’t printing at home, taking the cut paper to a place like OfficeMax or Staples should work the same way. 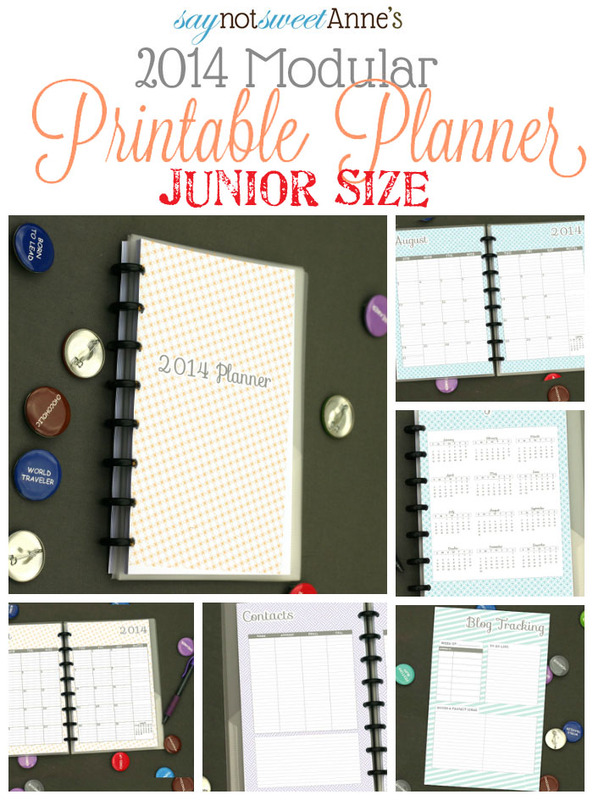 Just like the full size planners, these junior versions will be available in my Etsy store. Keep checking back here though, because I’ve got coupon codes and free add-ons planned! Be sure to Like Sweet Anne Designs on FB and sign up for the craft newsletter so that you don’t miss a deal! Right now, all Fans of the Sweet Anne Designs FB Page get a coupon code! 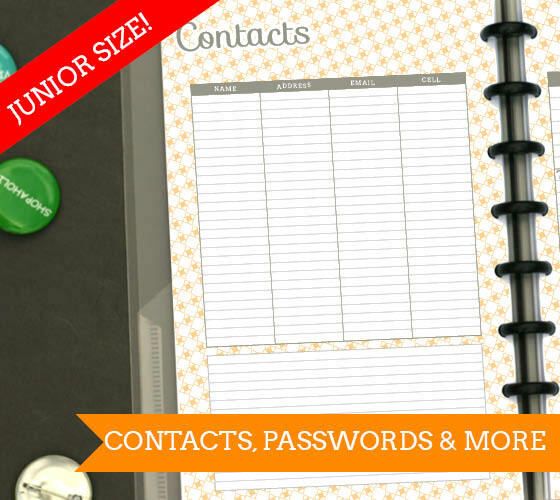 Get the 2014 Planner Here! So thrilled to see the half-sized planners now hon! These will fit perfectly in the new DayTimer that I received for Christmas!!! There are holiday-free versions in the Etsy store that should be great for you! Hi! 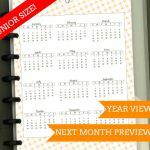 I love your planners, I looked on Etsi but didn’t find the Junior size planner for June 2014 to June 2015… Does it exist and I’m not looking right?? 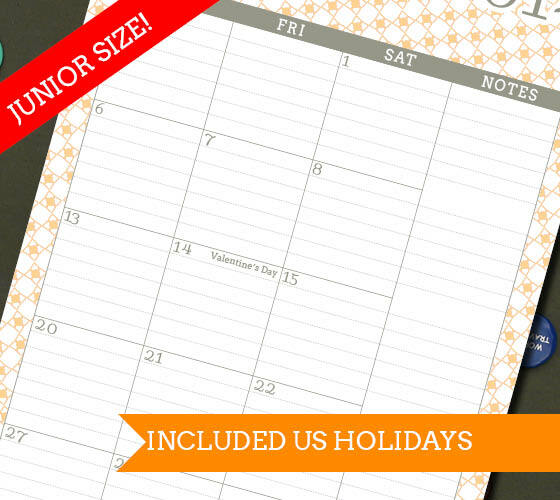 There is not a Junior sized student planner right now. I have intentions of creating one, but time is tight and I’m not sure when. 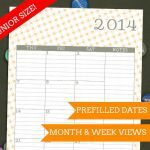 Is there a planner for 2015 to2016?? I really want to prepare for next year.. 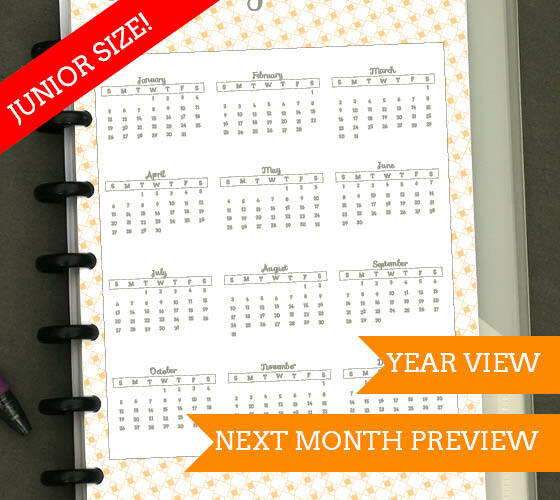 The new planner line for 2015 will launch this month! Stay tuned!